Predicting the weather can be hard enough on a day to day basis. But forecasting whole seasons is an entirely different challenge. Winter may start in December, but winter weather can happen anytime. Last year, parts of the upper Midwest were pounded by snow and below-average temperatures by early November. Much of that snow was gone by Christmas, but it didn’t mean the snow was done for the season. This year, The National Oceanic and Atmospheric Administration is predicting cooler and wetter weather in the South, and above-average temperatures in the West and across the Northern part of the county. NOAA is also predicting a drier winter for the northern Rocky Mountain areas, upper plain states, and the Great Lakes-area. But it’s important to remember that those predictions are for the season, and what you get hit with on a day-to-day basis is different. It may be sunny when you drive to work, but that doesn’t mean you won’t have a snowstorm or downpour to deal with. If you do, is your car ready? It’s important to be prepared for what winter driving brings, not to mention what it can do to your car. If you want to keep your car driving well through the winter months so it comes out OK on the other side of the coldest season, you have to be ready. Here are some tips to keep yourself out of trouble while driving this winter. Check Your Tire Tread And Pressure. If your car can’t stay on the road, it puts you and those driving around you at serious risk. That starts with your tire’s tread and inflation. If the tread is low, it hampers your car’s ability to grip the road. This is obviously an issue anytime of the year, but snow, slush and ice that can accumulate on the roads can make for dangerous driving. Here’s how to do a check yourself: Take a quarter and place it in the tire tread with Washington’s head pointing down. If Washington’s entire head is visible, it’s time to get new tires. Having tires that are properly inflated isn’t just about safety – it can save you money as well. According to the Department of Energy, every pound per square inch (PSI) that your tires are underinflated, lowers your gas mileage by 0.3 percent. That may not sound like much, but consider this: Proper inflation can raise gas mileage by 3.3 percent, or savings of up to 11 cents per gallon. Not sure what to inflate your tires to? Check the sticker on the driver’s side door jamb or in the car’s owner’s manual. Tires lose a pound of pressure for every 10-degree Fahrenheit drop in the temperature, so make sure you keep a close eye on it. Make Sure You Can See. Standard wiper blades are made of rubber, and over time, they can wear down or crack, making them very ineffective to clear off snow and ice. Streaky windows hamper your ability to see the road, so make sure you check and replace, if necessary, your wiper blades. Also key is making sure your windshield-washer fluid tank is full, and make sure you have a gallon in the car with you in case you run out. Snow and slush make your windshield a mess in a hurry; it’ll surprise you how quickly you’ll run through washer fluid. Get Your Battery Checked. 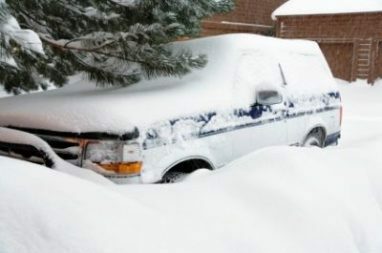 Ever notice how your car strains a little bit when you turn the key in the winter? That’s because as it gets colder, the battery has to work hard to turn your engine over. Make sure that it’s getting a proper charge by getting the battery tested. Most service centers will do it for cheap – or for free – and checking can be the difference between getting home safely or getting stranded on the side of the road. Hope For The Best, Prepare For The Worst. A simple survival kit stashed in your trunk can be a lifesaver. A bag of salt, spare shovel, jumper cables and blankets are vitally important should your car break down and you end up stranded on the side of the road. The North Dakota Department of Transportation has some more helpful suggestions for what to keep with you while driving. Keep Your Lights Clean. Whenever you stop for gas, it’s a good practice to use the windshield washer to clean off your headlights. Given how early it gets dark – particularly in places like North Dakota or Alaska – you spend a lot of time driving with your lights on. Take 15 seconds to scrub off the grime so you can see – and be seen – when you’re out on the road. Car Not Up For Winter? Donate It! If you’re worried that your car isn’t up for the challenge of winter and a new purchase is in the cards, consider donating your vehicle to Wheels For Wishes benefiting Make-A-Wish. Your unwanted vehicle can help inspire a local child and make their wish come true. All you need to do is donate an unwanted car, truck, SUV, RV, motorcycle, or boat and it will help to grant a wish for a local child in your community. All of the hassle typically associated with getting rid of an unwanted vehicle is handled for you. No paying for and posting listings. No dealing with setting up times for potential buyers to view the vehicle. No haggling or price wars. No producing maintenance logs or waiting for a buyer to have their mechanic look it over. Plus you’ll get a tax deduction for your vehicle, which you don’t get when you try to sell it.